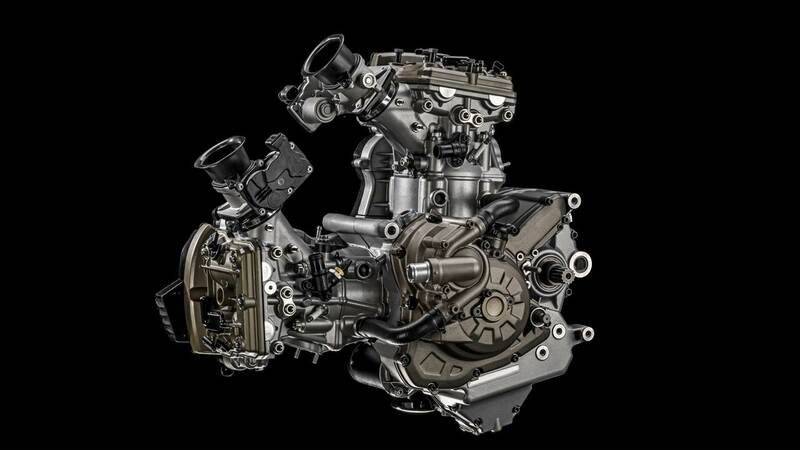 Ducati presents the first motorcycle engine with variable timing of both the intake and exhaust camshafts. Named Ducati Testastretta DVT, Desmodromic Variable Timing, Ducati’s new Desmodromic engine is the first in the world with variable timing on both inlet and exhaust camshafts, leading the way for a whole new generation of such engines. The innovative, new design overcomes an engineering gap in current production motorcycle engines and underlines Ducati’s strength in developing ground-breaking engine and motorcycle technologies. The variable timing system is able to continuously adjust valve timing, by acting independently on both the intake and exhaust camshafts. The system optimises engine performance throughout the rev range and in any operating condition, to guarantee the highest power, smooth delivery, muscular torque at low rpm and reduced fuel consumption. With full Euro 4 compliance, DVT sets a new standard in the combination of power, delivery and usability of motorcycle engines. By independently adjusting both the timing of the camshaft controlling intake valves and the timing of the camshaft controlling exhaust valves, the Ducati Testastretta DVT engine optimises high rpm performance for maximum power, while at medium and low rpm, it ensures smooth operation, fluid power delivery and high torque. This means that the vehicle’s engine will adapt its characteristics according to rpm values, while always ensuring compliance with exhaust emission standards and keeping fuel consumption low. When a new engine is designed, one of the most critical parameters to determine its ‘character’ is the amount of intake and exhaust valve overlap. The overlap angle is defined as the interval of crankshaft rotation, expressed in degrees, during which both the intake and exhaust valves are open at the same time. This overlap occurs between the end of the exhaust stroke and the start of the intake stroke and is normally a single value that does not change. However, the Testastretta DVT is not limited by a fixed valve overlap angle. Instead, the Ducati Testastretta DVT’s overlap angles can change, thanks to the introduction of the DVT (Desmodromic Variable Timing) system: a valve timing adjuster fitted to the end of each of the two camshafts per cylinder head. The DVT system consists of an external housing, rigidly connected to the cam belt pulley, and an internal mechanism which is connected to the camshaft and can independently rotate inside the housing. This rotation of the internal mechanism, either in advance or in delay with respect to the housing, is precisely controlled by varying the oil pressure in special chambers of the mechanism. The oil pressure is adjusted by dedicated valves and the timing of each cam is dynamically controlled by a sensor located in the cam covers. Desmo attraction The Ducati Testastretta DVT engine uses the unique valve train that made the Bologna-based Italian manufacturer a world-famous name. Thanks to this unique system, the intake and exhaust valves are closed mechanically and with the same level of accuracy as they are opened. The term Desmodromic derives from the Greek words “desmos=link” and “dromos=stroke, travel”; in mechanical engineering terms, it refers to mechanisms designed to actuate valves both in the opening direction and in the closing direction. This system, used in all Ducati models, has also been extremely successful in Ducati Corse World Superbike and Desmosedici MotoGP motorcycles. In the development of the DVT, the Desmodromic valvetrain represents a major advantage over a traditional spring based timing system; the actuation of the valves at low engine speed requires less force, not having to compress the valve springs, this allowed Ducati to limit the size of each cam phaser with obvious benefits in terms of lightweight construction and compactness for a perfect engine integration. By independently adjusting both the timing of the camshaft controlling intake valves and the timing of the camshaft controlling exhaust valves, the Ducati Testastretta DVT engine optimises high rpm performance for maximum power, while at medium and low rpm, it ensures smooth operation, fluid power delivery and high torque. This means that the vehicle’s engine will adapt its characteristics according to rpm values, while always ensuring compliance with exhaust emission standards and keeping fuel consumption low. When a new engine is designed, one of the most critical parameters to determine its ‘character’ is the amount of intake and exhaust valve overlap. The overlap angle is defined as the interval of crankshaft rotation, expressed in degrees, during which both the intake and exhaust valves are open at the same time. This overlap occurs between the end of the exhaust stroke and the start of the intake stroke and is normally a single value that does not change. However, the Testastretta DVT is not limited by a fixed valve overlap angle. Instead, the Ducati Testastretta DVT’s overlap angles can change, thanks to the introduction of the DVT (Desmodromic Variable Timing) system: a valve timing adjuster fitted to the end of each of the two camshafts per cylinder head. The DVT system consists of an external housing, rigidly connected to the cam belt pulley, and an internal mechanism which is connected to the camshaft and can independently rotate inside the housing. This rotation of the internal mechanism, either in advance or in delay with respect to the housing, is precisely controlled by varying the oil pressure in special chambers of the mechanism. The oil pressure is adjusted by dedicated valves and the timing of each cam is dynamically controlled by a sensor located in the cam covers. The Ducati Testastretta DVT engine uses the unique valvetrain that made the Bologna-based Italian manufacturer a world-famous name. Thanks to this unique system, the intake and exhaust valves are closed mechanically and with the same level of accuracy as they are opened. The term Desmodromic derives from the Greek words “desmos=link” and “dromos=stroke, travel”; in mechanical engineering terms, it refers to mechanisms designed to actuate valves both in the opening direction and in the closing direction. This system, used in all Ducati models, has also been extremely successful in Ducati Corse World Superbike and Desmosedici MotoGP motorcycles. In the development of the DVT, the Desmodromic valvetrain represents a major advantage over a traditional spring based timing system; the actuation of the valves at low engine speed requires less force, not having to compress the valve springs, this allowed Ducati to limit the size of each cam phaser with obvious benefits in terms of lightweight construction and compactness for a perfect engine integration.